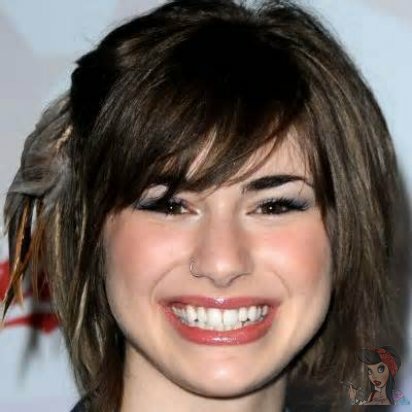 One of the quirkier contestants in American Idol history, Siobhan Magnus attracted an audience during the show’s 2010 run with her deadpan demeanor and high soprano range. Mangus was only 19 years old when the season began, having recently graduated from Barnstable High School in Hyannis, MA. It was at Barnstable High that she began focusing on music, and her membership in the Barnstable drama club (which included lead roles in several school musicals) was documented in High Drama, a WB reality series about Barnstable’s production of The Wizard of Oz. One year after the show, she traveled to Boston to audition for American Idol, eventually becoming one of the show’s Top Ten contestants. Siobhan has one tattoo on her right upper shoulder which is inspired by the book "The Gashlycrumb Tinies" by Edward Gorey. 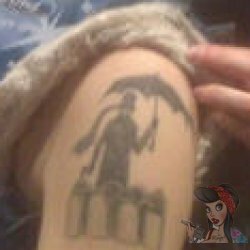 This tattoo is of a man with a skull for a head holding an umbrella over small children.